Earlier this year, my son and I released our first all-ages graphic novel collaboration titled PUNK TACO. 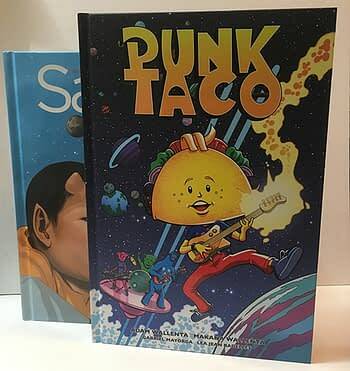 PUNK TACO Volume 1 and 2 are both oversized 8×12 Hardcover books with a matte cover with a spot varnish and full-color glossy interior pages on extra heavy paper. 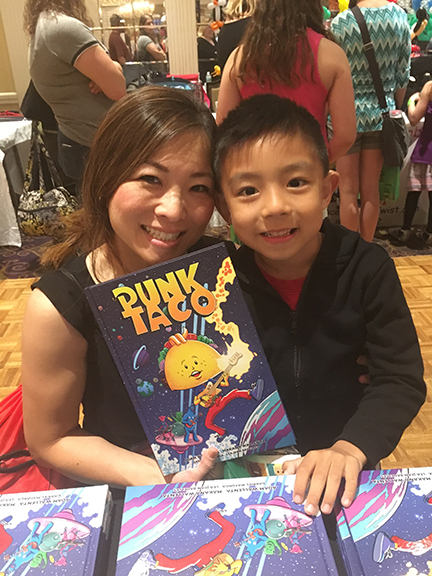 A perfect book for young readers as well as adults. Kids love the extra large format. 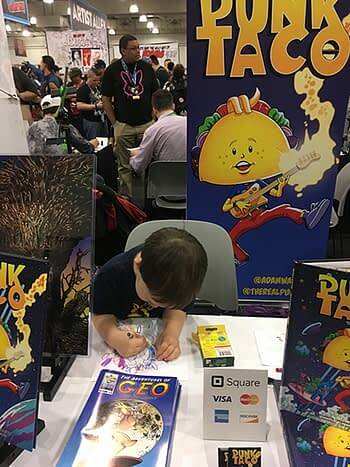 Some of you may remember that PUNK TACO was funded on KICKSTARTER last year and an article about its creation was featured on Bleeding Cool. 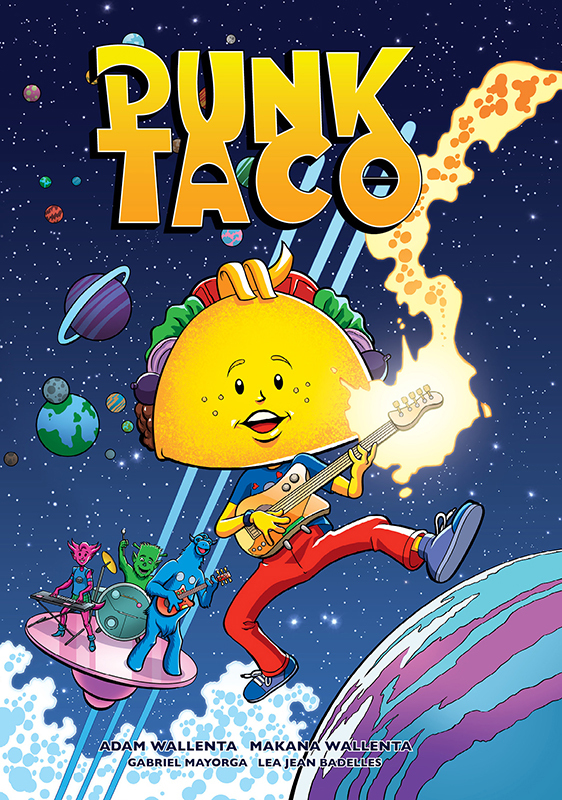 In case you missed it, PUNK TACO is an all-ages graphic novel, created by myself and my son (who was 5 at the time), about an alien taco and his band of misfits who rock out across the galaxy spreading peace and love through their music. 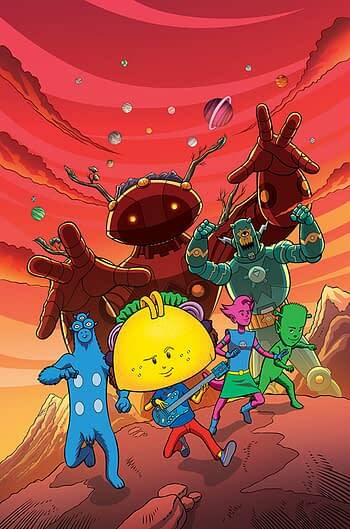 Along their travels they get into a bit of trouble, make some new friends and help save the universe from an intergalactic tyrant. 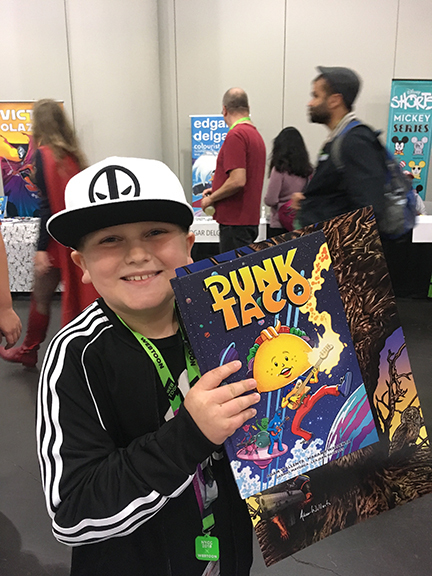 PUNK TACO is a story about friendship, empathy, compassion and doing the right thing against all odds. 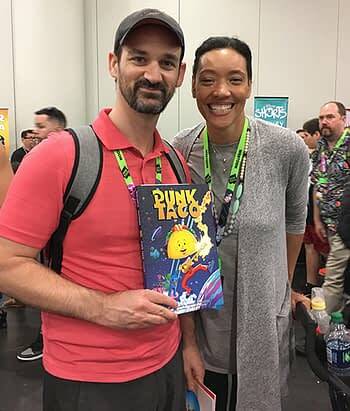 It’s a great story for kids as well as adults who are looking to read something positive and uplifting after their usual dose of hyper-realism and post-apocalyptic terrors. 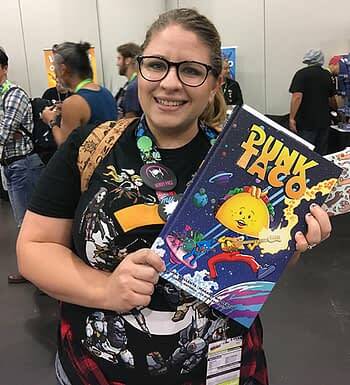 PUNK TACO Volume 2 tentative cover. 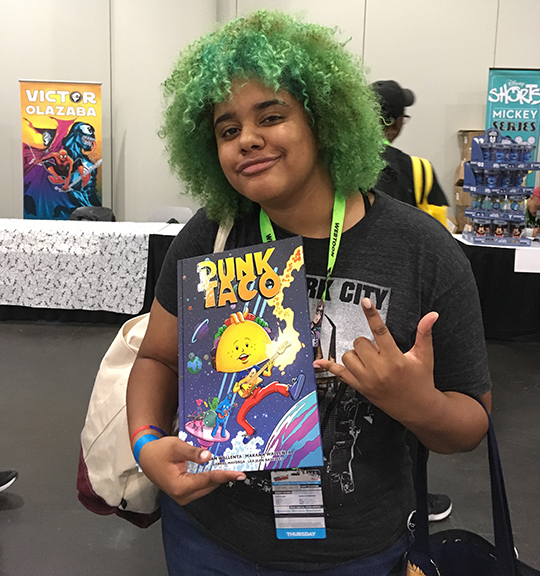 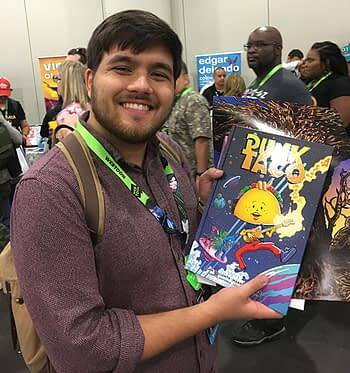 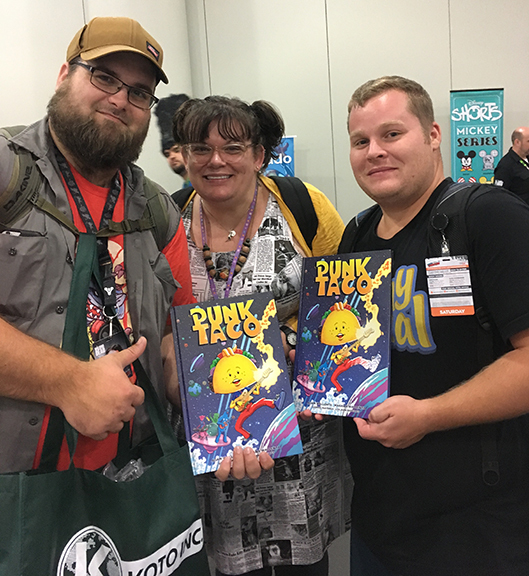 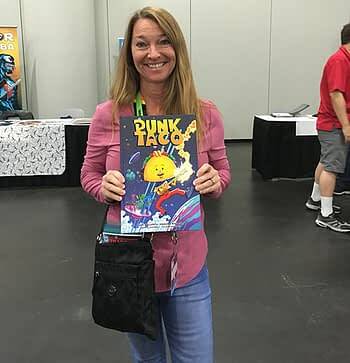 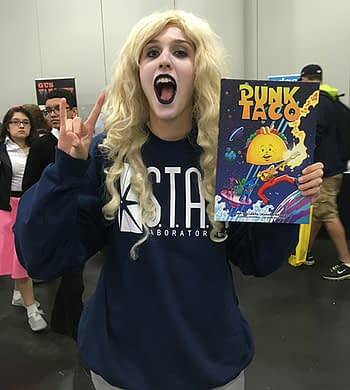 After a successful KICKSTARTER campaign, PUNK TACO Volume 1 finally saw print and landed in the United States this past May. 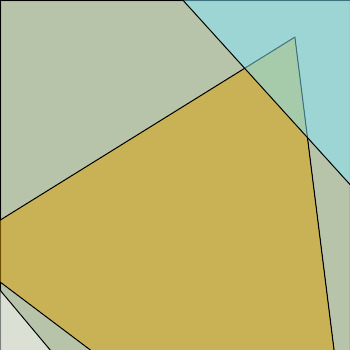 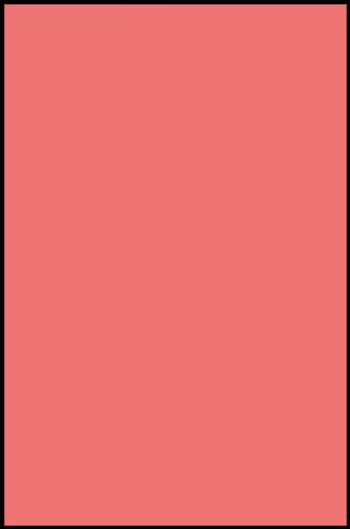 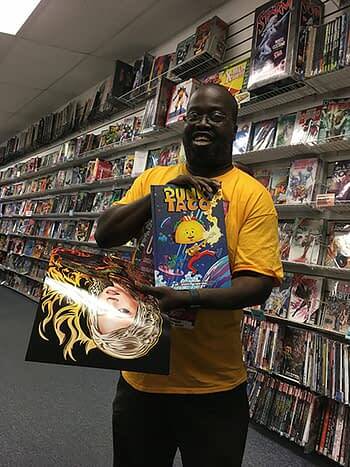 Shortly after we were stunned to learn that Diamond Comic Distributors would not distribute our gorgeous 8×12 hardcover because “we didn’t have a long term goal and a list of future publications ready to go”. Well as any small publisher can tell you, it’s hard to have a long-term goal if you don’t have distribution. 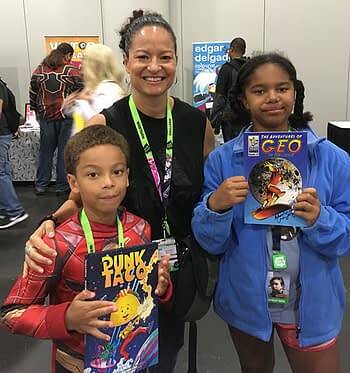 So after 20 years of Diamond distributing my books, I was on my own. 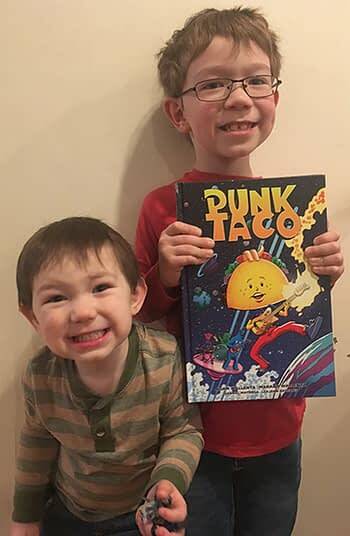 The day PUNK TACO volume 1 arrived from the printer was a great day to be picked up from school. 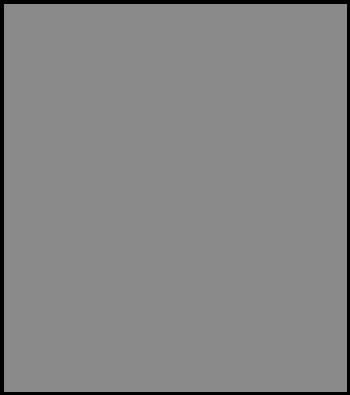 But the odds are always against small, independent publishers, and I have never let obstacles stop me before. 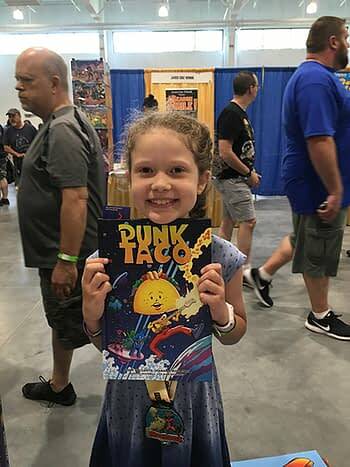 So we decided we would bring PUNK TACO directly to the masses, doing in-store book signings at comic book shops, book stores, festivals, conventions and libraries across America. 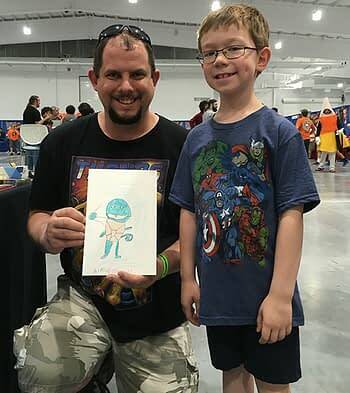 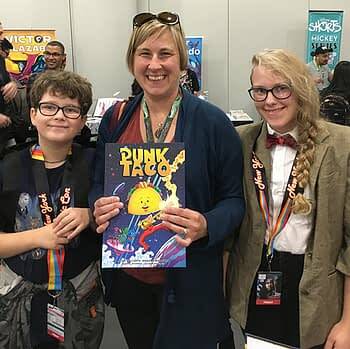 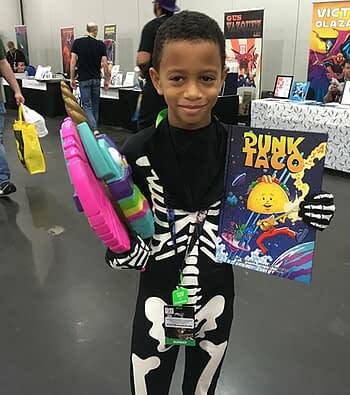 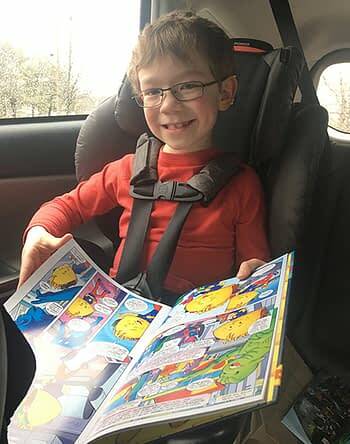 So my son and I, along with his brother and my wife set out to spread the good word about all-ages comics and bring PUNK TACO to as many people as possible. 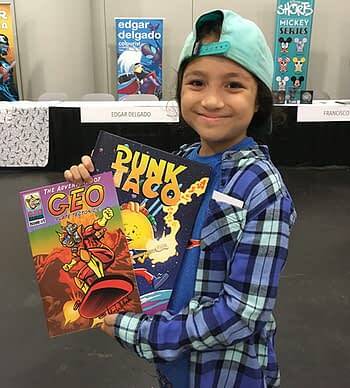 It’s truly been a family affair since not only did I create PUNK TACO with my son, but I also created an all-ages educational science comic series called “The Adventures of GEO”, with my wife, Dr. Kanani K.M. 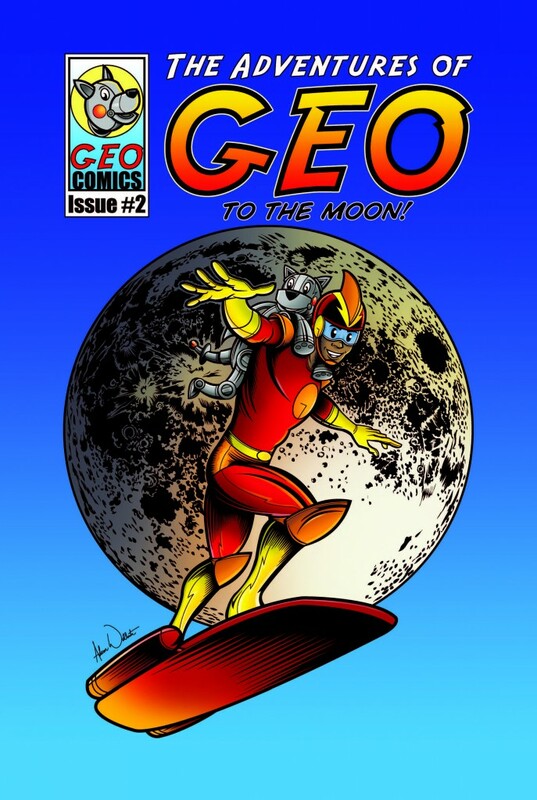 Lee, who is a geophysicist and professor at Yale University. 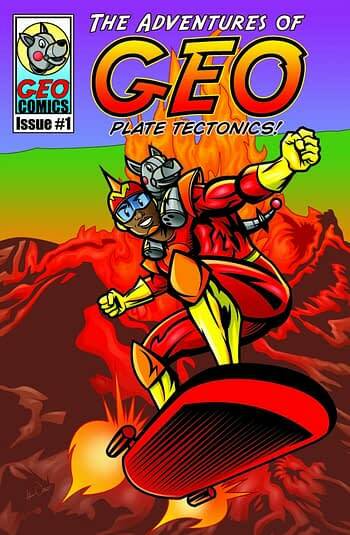 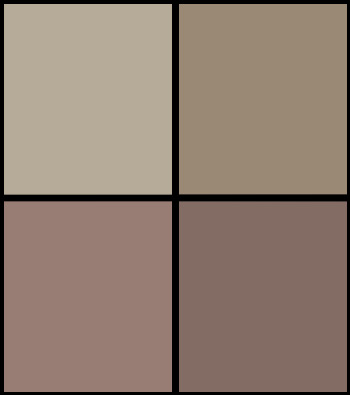 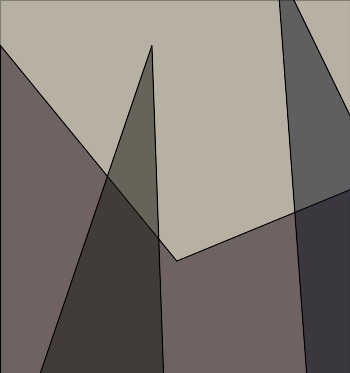 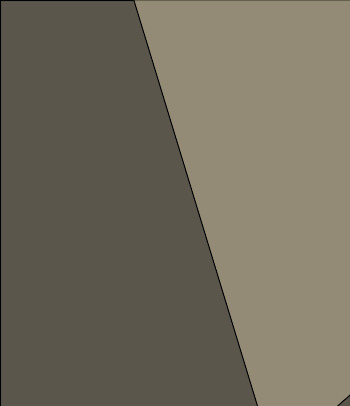 The Adventures of GEO 1, by my wife and I. 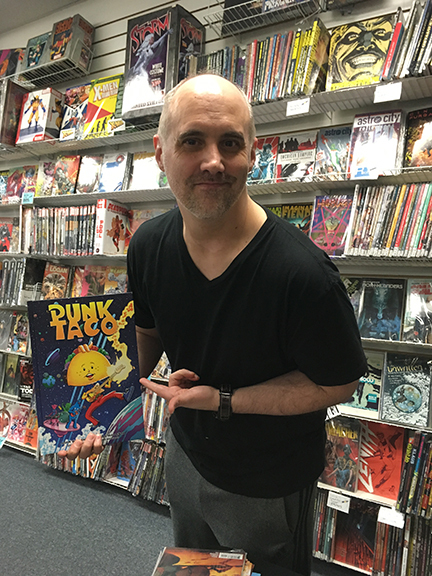 Our tour began in our home state of Connecticut at Alternate Universe on Free Comic Book Day and followed with a stop at Aw Yeah Comics in Harrison, NY. 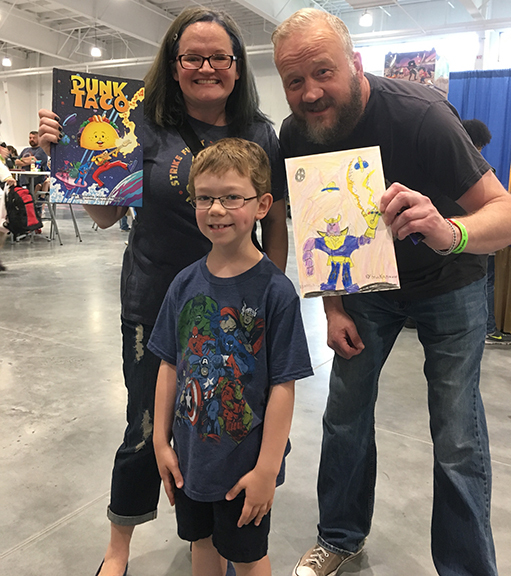 We also had the pleasure of attending KIDS CON NEW ENGLAND which was an amazing all-ages show. 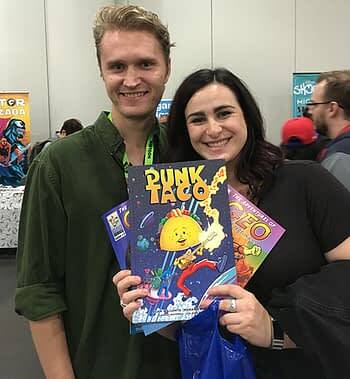 Our travels took us as far as the west coast as we traveled up the coast of California to numerous comic shops and libraries, finally ending our tour at the amazing Arcane Comics in Seattle, Washington. 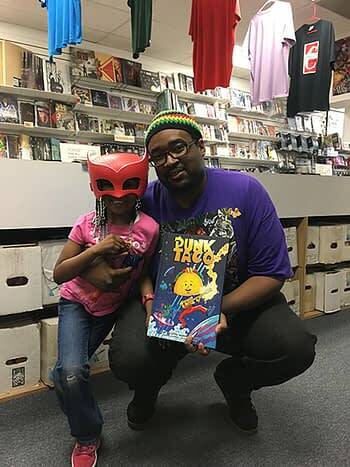 Free Comic Book Day at Alternate Universe in Milford, CT, brings out the superheroes! 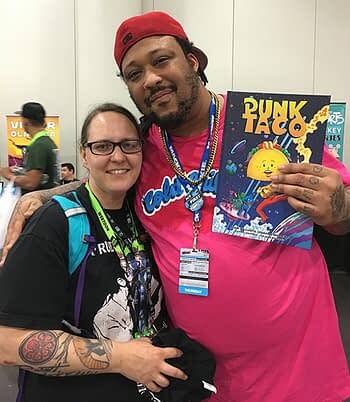 The Legendary TC Ford loves PUNK TACO! 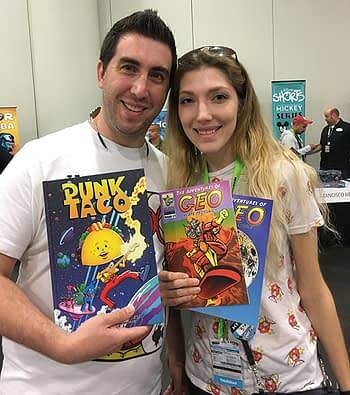 The super talented Bill Walko creator of Hero Business. 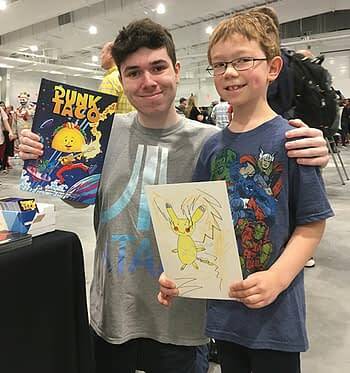 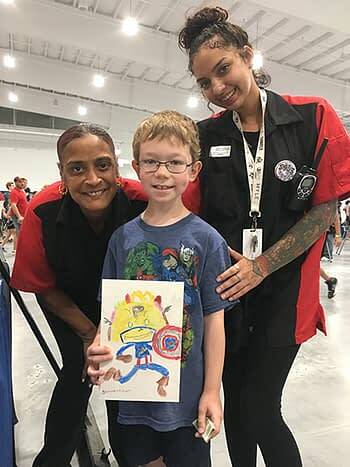 Smiles at KIDS Con New England! 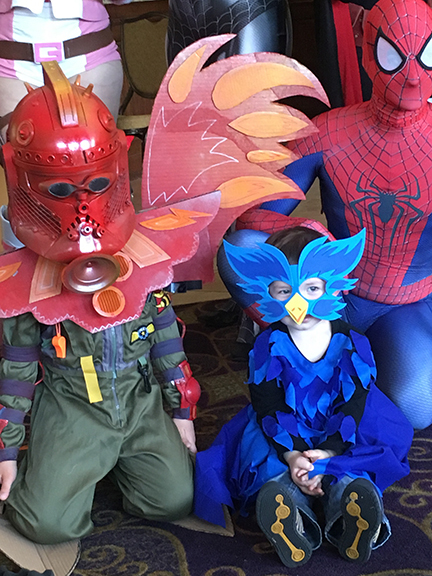 My boys even entered the costume contest at KIDS Con New England and won Best Family Cosplay! When we arrived back east, we attended ComiCONN, and Terrificon, both in Connecticut, did a signing at the world-famous Comic Book Jones on Staten Island in NY, attended Baltimore Comic Con and this past week we had the most amazing New York Comic Con experience ever, selling out of over 4 cases of PUNK TACO. 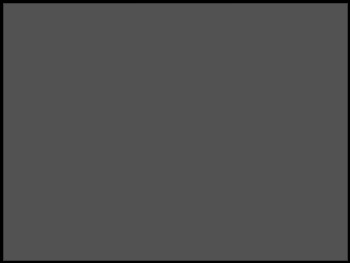 Lastly we will be ending the season as guests at the Saugatuck Story Festival on October 13th. I can go on and on about how great the fans have been, and all the smiles we have shared with our supporters but I think it’s better to let the pictures speak for themselves. Check out all those happy faces! 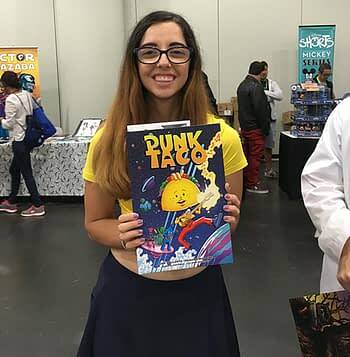 Live from ComiCONN! 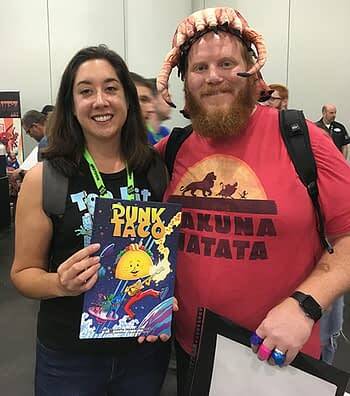 Markellus Ragans, co-host of So Wizard Podcast loves PUNK TACO. 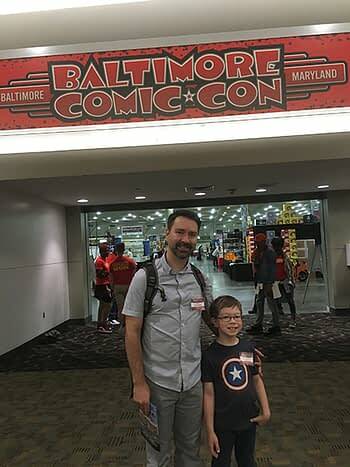 Adam and Makana arrive at Baltimore Comic Con! 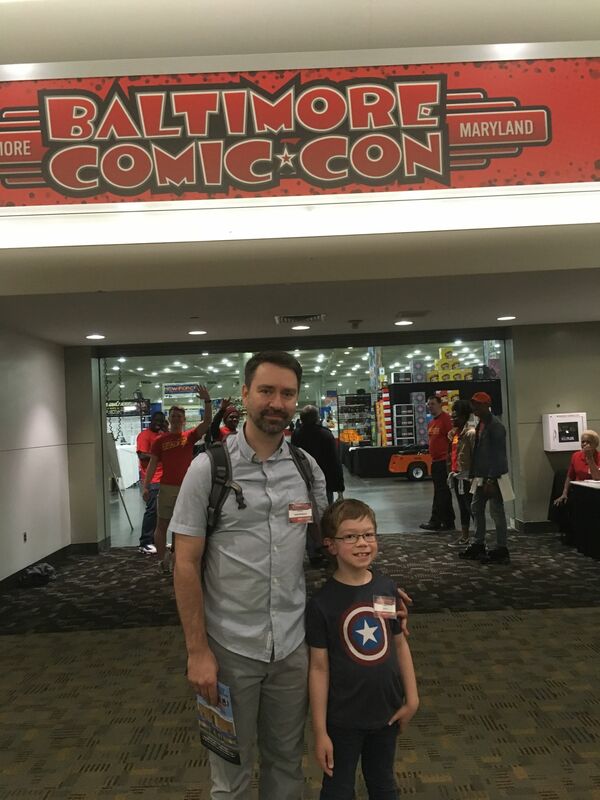 Baltimore comic book fans are awesome! Adam and Makana at Baltimore Comic Con! 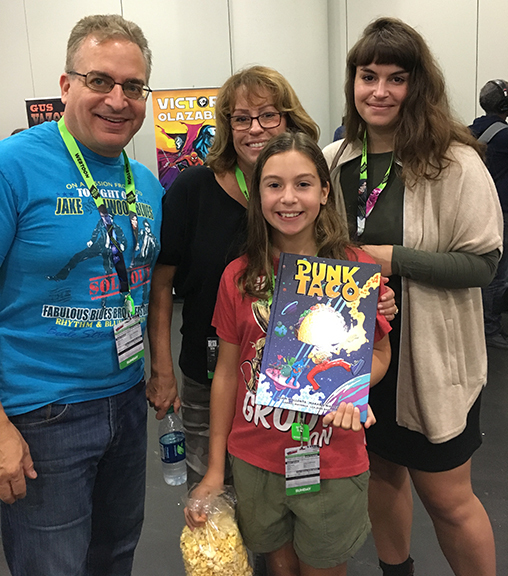 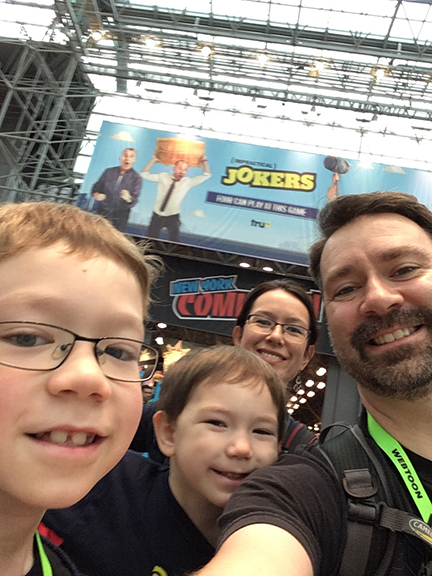 The Family Arrives at New York Comic Con! 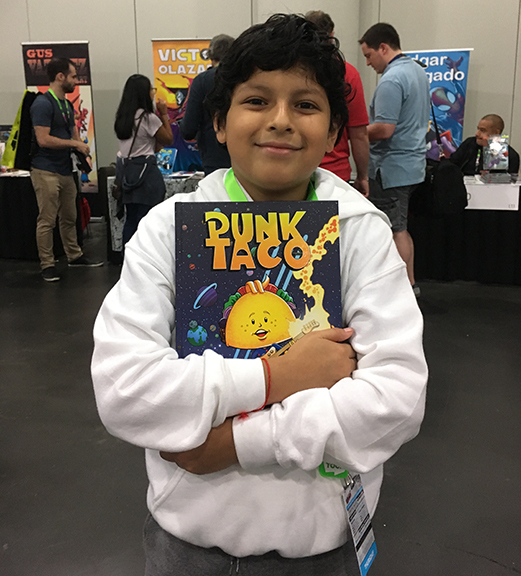 Our first supporter at NYCC! 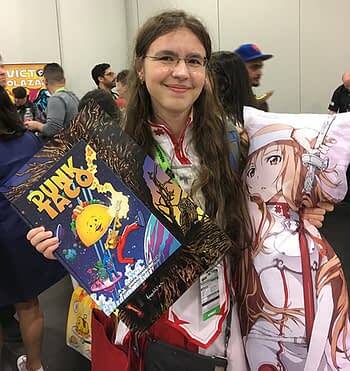 The doors barely opened and she knew exactly what she wanted. 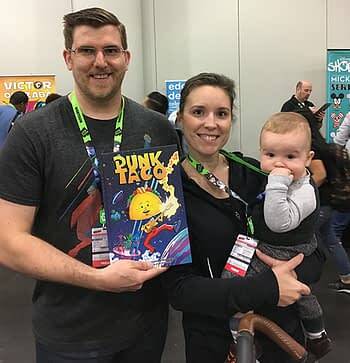 A couple with a young child invest in some great future reading material. 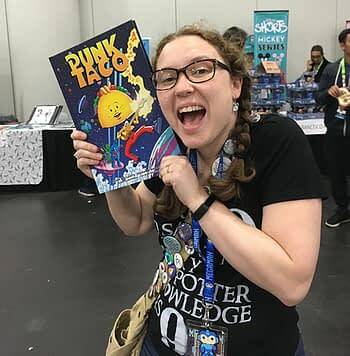 We love when fans can’t contain their excitement! 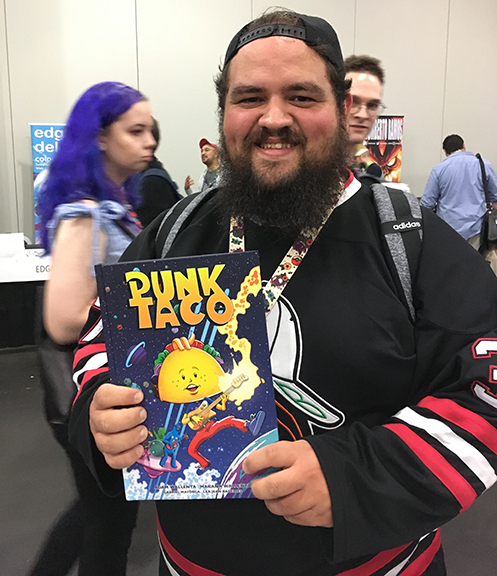 Guys with beards love PUNK TACO! 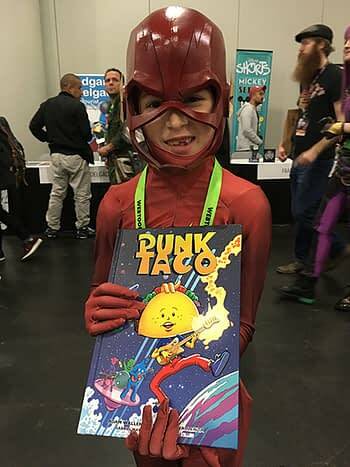 The FLASH loves PUNK TACO! 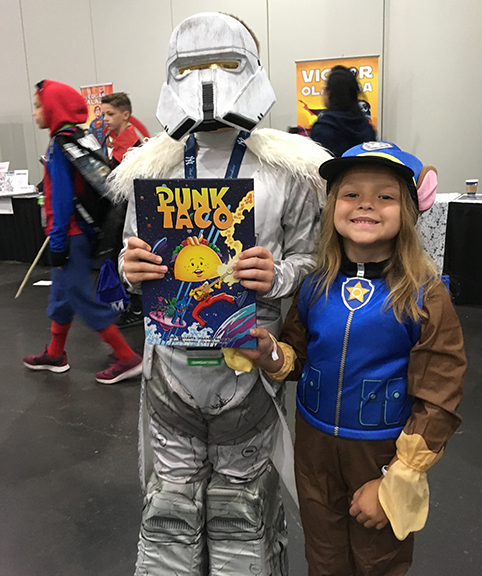 Storm Troopers and Paw Patrol love PUNK TACO! Iron Man loves PUNK TACO! 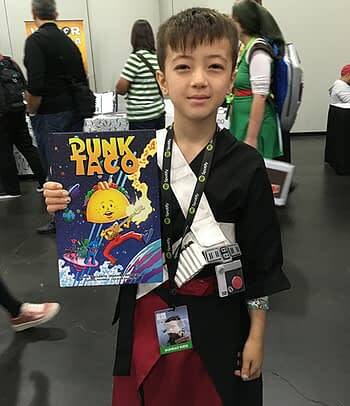 Chirrut Îmwe loves PUNK TACO! 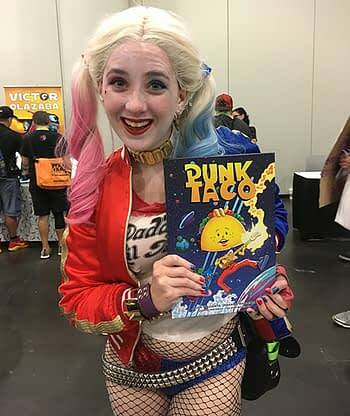 Harley Quinn loves PUNK TACO! This awesome dad had to buy 2 copies because he knew his kids would fight over it. 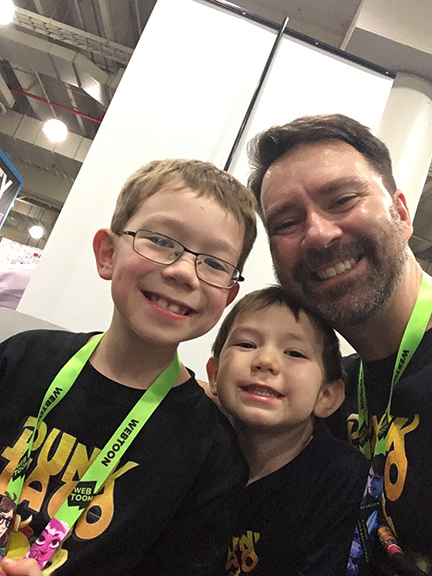 This has been a truly amazing experience sharing these experiences with my son who is now 7. 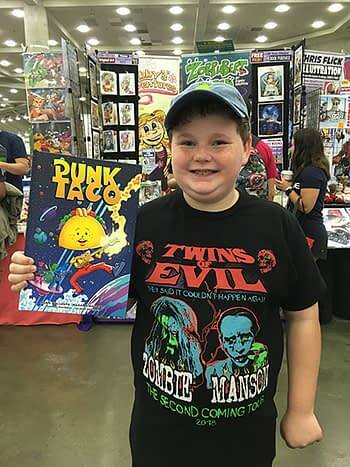 Not only does he help sell our book, PUNK TACO, but he also creates original artwork and sells them to collectors of all ages, some of which are notable creators such as Joe Caramanga and legendary artists such as Eric Orr (who created the first HIPHOP comic book) but most importantly they are all awesome comic book fans who are supporting and encouraging the future generations of artists. 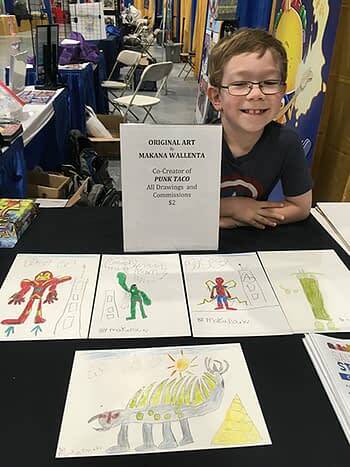 Makana is all set up at Terrificon and ready to sell some art! 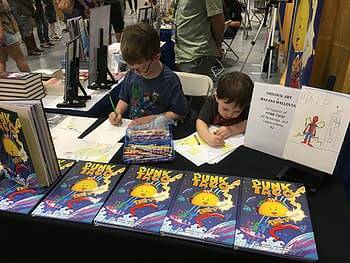 Makana and his brother busy drawing for the fans. Makana’s first customers at Terrificon loved his PUNK TACO/Captain America mashup. Writer/Artist Joe Caramanga stopped by to say hello at Terrificon and pick up an original Iron Man drawing. 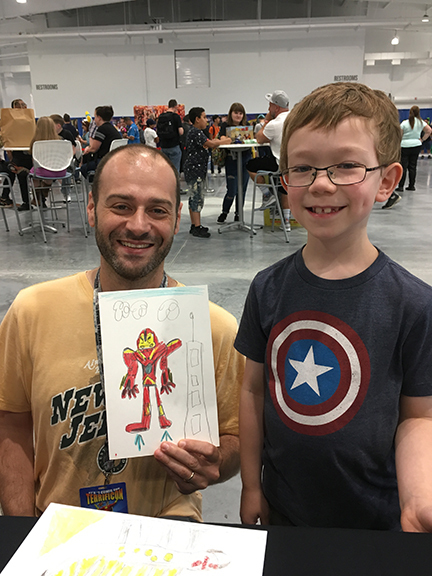 Legendary Graf Artist/Illustrator/Designer and Painter and creator of the first HIPHOP Comic Book: Eric Orr stopped by to say hello at NYCC and pick up an original Iron Man drawing from Makana. 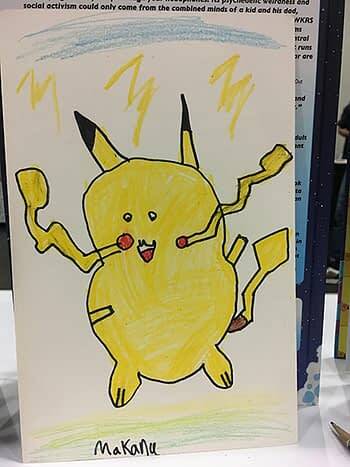 Pokemon are always a hit and Makana loves drawing them. Young fans supporting young artists. 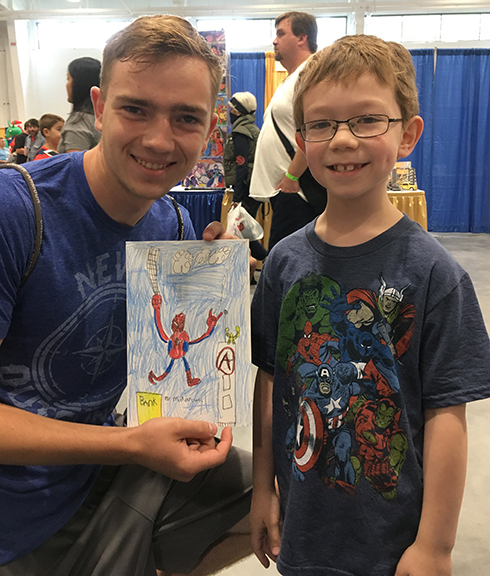 A great Spiderman sold to a happy customer! 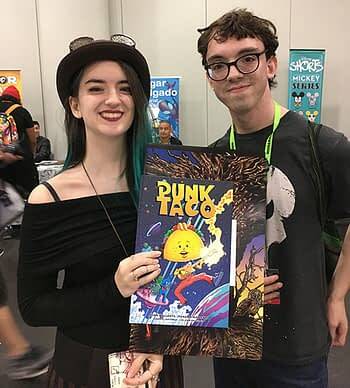 PUNK TACO fans love to get original art from the co-creator. 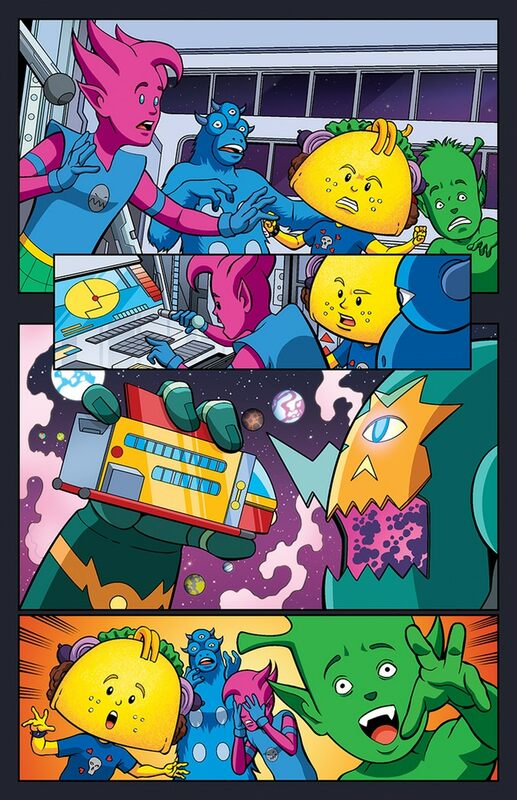 Check out Thanos! Spiderman stopped by Baltimore Comic Con to get an original of him and Vision. My little artist hard at work at NYCC! 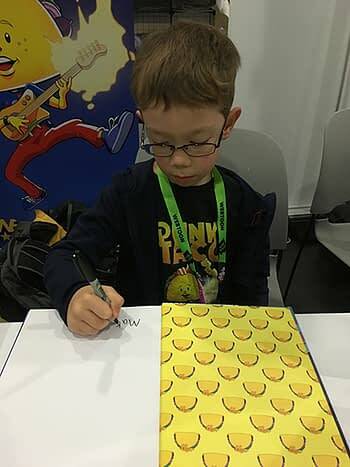 Makana working on his first commission request at NYCC! We created PUNK TACO to bring smiles to people’s faces and we have been achieving that with every new fan we make. 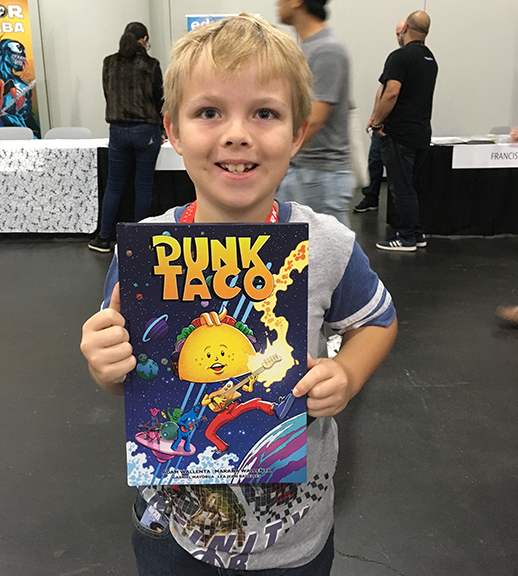 Both children and adults have been sharing their love for PUNK TACO with us and it motivates my son and I to keep creating. 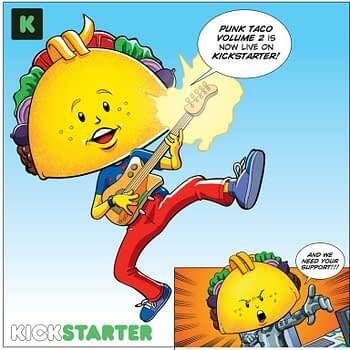 We are now attempting to fund PUNK TACO Volume 2. We got off to a slow start and have been told it would be impossible to achieve our goal but we’ve been defying the odds from the start and I believe we can reach our goal with the people’s support. It’s all about the smiles and bringing smiles to the fans. We currently have two BLEEDING COOL Rewards. 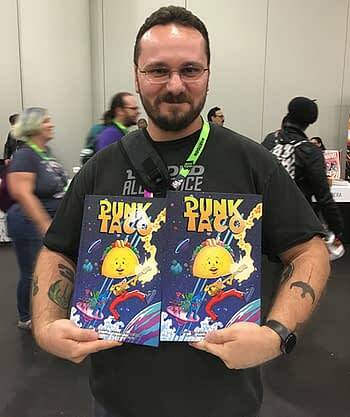 The first reward includes both PUNK TACO Volume 1 and 2 with extras and the second reward includes a single copy of Volume 2 with bonus extras. 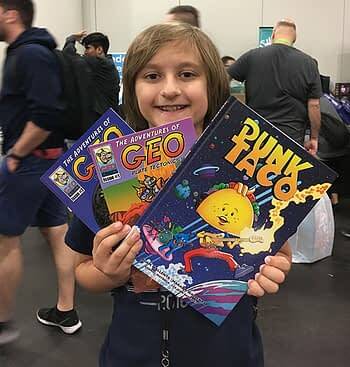 Check them out and help us achieve the impossible. Check out the awesome BLEEDING COOL Rewards! 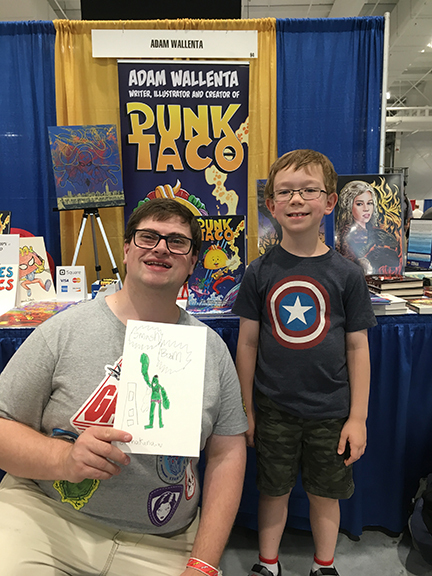 Adam Wallenta is a professional illustrator and emcee. 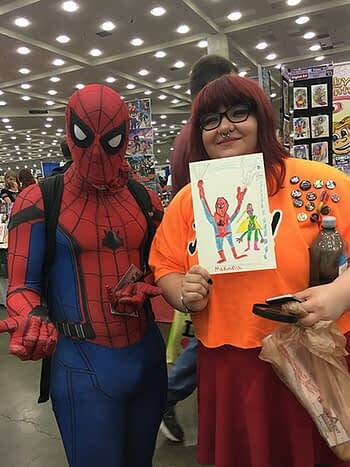 He has worked as a colorist for both Marvel and DC Comics and has illustrated dozens of children’s books and novels. 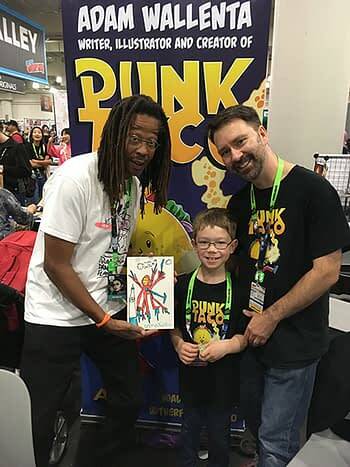 He is the owner of Adam Wallenta Entertainment and has written and illustrated the official Public Enemy comic book series with Chuck D, The True Adventures of Adam and Bryon and The Adventures of Geo among many others. 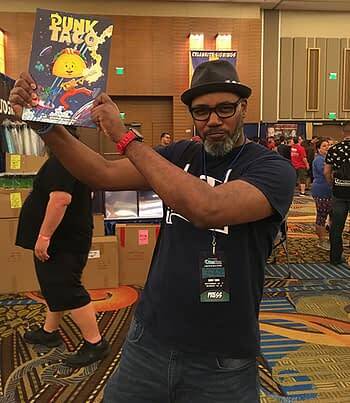 Adam is also the creator of the original HipHop and Comic Books panel that started at NewYork Comic Con that continues to travel to conventions across the country. Adam is also a world-famous underground emcee who performs under the stage name ILLUS and has released 16 musical projects featuring some of HipHop’s greatest emcees and producers. 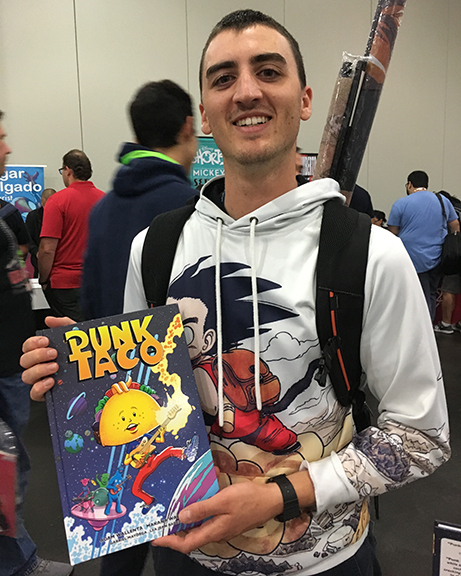 Support Punk Taco and find Adam online. 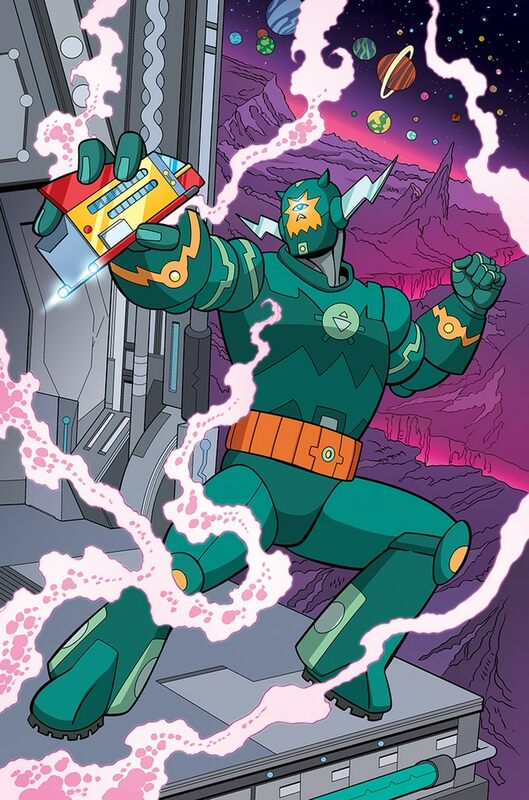 Did You Get a Gunning For Hits Mini-Comic From Jeff Rougvie and Moritat at NYCC?